As we have learned in previous lessons, double tops and double bottoms are forex, futures and stock chart patterns which show that the momentum needed to break a specific level of resistance for the double top and support for the double bottom is not there. When these patterns show up on a stock, futures or forex chart day traders will look for a reversal of the current trend. In this lesson we are going to look at a chart pattern which also shows that the momentum needed to break a support or resistance level is slowing which is known as the head and shoulders pattern and the reverse head and shoulders pattern. Once we have a sound understanding of how to spot these patterns we will then look at a specific strategy for trading these patterns when they appear on a chart. A Head and Shoulders pattern is defined by one peak, followed by a higher peak, which is then followed by a lower peak, and finally a break below the support level established by the two troughs formed by the pattern. As you can see from the above chart a head and shoulders pattern is basically showing the buyers trying 3 times unsuccessfully to take the market higher before finally giving way to the sellers who theoretically retain control after the 3rd failure. The head and shoulders pattern is thus seen as a potential reversal pattern and day traders will pay special attention to this pattern when it occurs on an uptrend, and will look to trade a potential reversal of the uptrend should the pattern play out. For further confirmation that the potential for a reversal is high traders often give more credibility to a falling neckline than they do a rising neckline. The reverse head and shoulders is basically a mirror image of the head and shoulders pattern and is defined by one trough, followed by a second lower trough, which is then followed by a third higher trough, and then finally a break above the resistance level established by the two peaks formed by the pattern. As you can see from the above chart, the reverse head and shoulders is basically showing the sellers trying 3 times unsuccessfully to take the market lower before finally giving into the buyers who theoretically retain control after the 3rd failure. Like the Head and Shoulders Pattern, the Reverse Head and Shoulders is seen as a reversal pattern, and traders of the stock, futures and forex markets will pay special attention to this pattern when it occurs as part of a downtrend should the pattern play out. For further confirmation that the potential for a reversal is high, day traders will look for a rising neckline. You should now have a good understanding of Head and Shoulders Patterns and Reverse Head and Shoulders patterns. 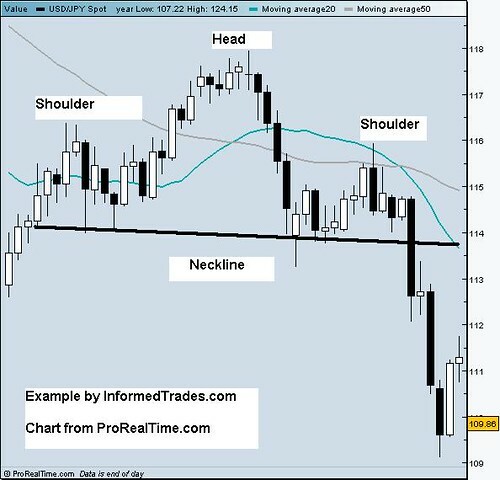 In our next lesson we are going to look at a specific strategy which traders commonly use to trade the head and shoulders and reverse head and shoulders complete with how to determine exact entry and exit points.